The number one choice for many years. 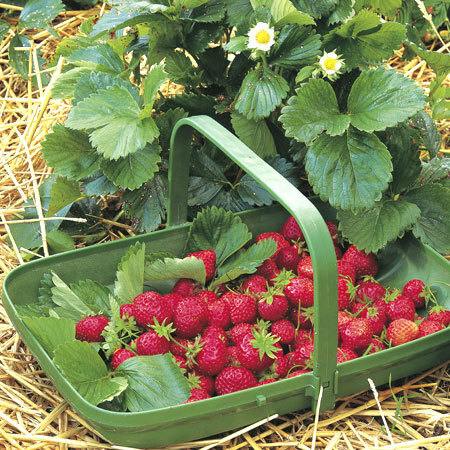 This main-season strawberry produces a bumper crop of juicy orange-red fruits with an excellent flavour and texture from June to July. This superb variety is reliable and tolerant of most situations. I ordered these plants in early October, however when the delivery date was confirmed we were going to be on holiday. Blackmoor delayed the delivery until our return. When received the plants were in good health and planted out the same day. Excellent service again. I bought bare rooted plants earlier this year. Strong, healthy stock with a good root system. Clear instructions. Excellent website and superb customer service. Cambridge Favourite has been a "Hardy Perennial" for amateurs and professionals alike for many years due to its respectable size of fruit and high cropping yields. Plants supplied in poly bags. Very pleased. I am a new customer and ordered the strawberry and asparagus collections. they were in good condition and excellent value. The first time I have ordered bare roots but arrived quickly and were easy to plant out.